When Christina Bianco (Missy), Diana Degarmo (Suzy), Jenna Leigh Green (Cindy Lou), and Sally Schwab (Betty Jean) come bouncing onto the stage of Off-Broadway’s intimate 100-seat Kirk Theatre at 42nd Street’s Theatre Row, their infectious and joyful energy quickly lights up the room as they begin a fun-filled musical romp through the hit pop tunes of the 1950’s & ‘60’s. 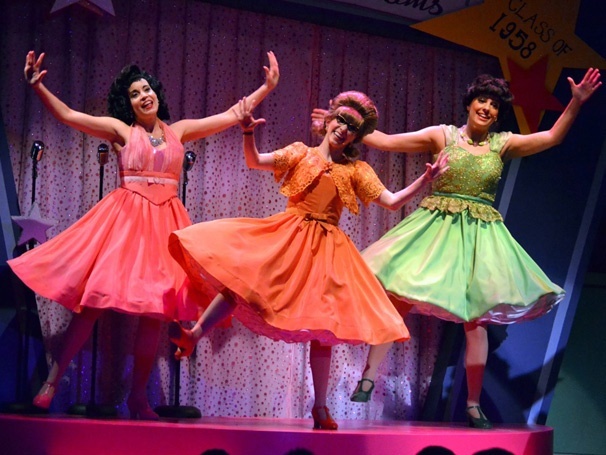 Set in 1958, the Marvelous Wonderettes (written and created by Roger Bean/ Directed by Tom D’Angora & Michael D’Angora) focuses on four classmates who have been tapped to provide the entertainment for their Senior Prom at Springfield High School. The gals had already proved their talent as song cheerleaders for the Springfield Chipmunks teams at the school, and with direction from their teacher and squad sponsor, Mr. Lee, they had even proudly won Third Place in the state’s Song Leaders Competition. Now they are given the chance to shine again when Mr. Lee notifies them that the scheduled prom entertainers are unavailable and asks the girls to fill in for the Super Senior Prom with its theme of “Marvelous Dreams.” Thus begins this cheerful trip down a delightful memory lane of tunes from the era. 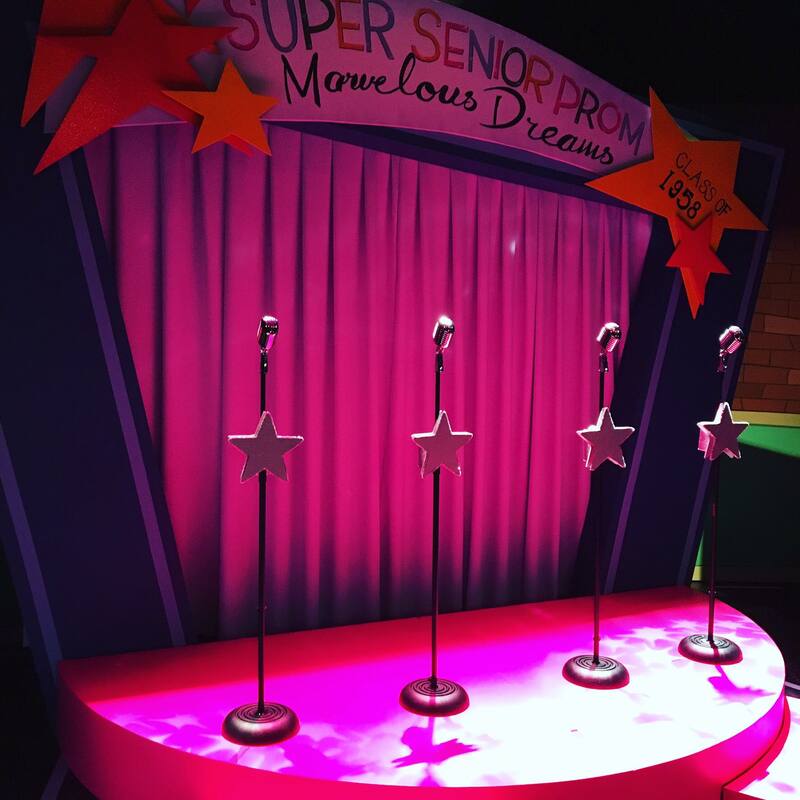 The attractive set design of William Davis sparkles in the lighting designs from Lois Catanzaro and has nicely captured the flavor of a decorated school gymnasiums that some of us might recall from Senior Proms of our own. The bright pastel dresses on the ladies (designer Bobby Pearce) had no shortage of crinoline petticoats, and they would have fit in nicely if this had been a show about square dancing. Throughout the show each of the characters has her own unique costume color: Missy – tangerine, Suzy – blue, Cindy Lou – pink, and Betty Jean – green. Adding to the fun are the deliciously outlandish beehive hairdos from wig designer, Jennifer Mooney Bullock. But on to the main event, the parade of innocent and memorable songs that ruled the airwaves and the music world at a time when loud drums and guitars had not yet combined with coarse language and political overtones to take the pop music scene in new directions. The show’s virtual smorgasbord of hits (Musical Director, Benjamin Rauhala) opens with the smooth harmonies of, “Mr. Sandman,” and then some flamenco-flavored claps and taps for a very sweet, “Lollipop” that blends gently into, “Sugartime.” It is clear from the beginning that these performers have uniformly fine voices, and audio engineers would do well to avoid overwhelming those talents with excess volume from the recorded soundtrack. Miss Green has fine solo moments for, “Allegheny Moon,” and there is a dreamy quality when the ladies offer both, “All I Have to Do is Dream,” and “Dream Lover.” Miss Degarmo provides a peppy, “Stupid Cupid,” Miss Schwab a perky, “Lipstick on Your Collar,” and Miss Green delivers a rousing, “Lucky Lips.” The lightweight dialogue links these numbers together as the girls engage in some typical cat fighting about boys. There is a nice change of pace when Miss Bianco sings a soaring, “Secret Love,” that really delivers on the line, “Now I shout it from the highest hill.” A nice medley of, “Sincerely,” and “Goodnight Sweetheart, Goodnight,” rounds out the first part of the program. The show’s printed program failed to include either a song list (which would be helpful to younger audience members unfamiliar with the songs), or any reference to a planned intermission. But there would be a break between the Act One prom scene and the Act Two class reunion scene that takes place ten years later. In that scene the gals are dressed in more disco-flavored costumes with colorful and high-topped patent leather boots and pant suits of shimmering metallic fabrics that looked like something one might see on Star Trek. Act Two numbers include such hits as “Heat Wave,” “You Don’t Own Me,” “I Only Want to Be With You,” “It’s My Party,” “Leader of the Pack,” “Rescue Me,” and “R-E-S-P-E-C-T.” All of the action is punctuated by assorted silly rivalries among the girls, disputes about cheating boyfriends, voting for prom queen (with a zany talent competition), crushes on a teacher, etc. Speaking of teachers, one lucky audience member gets selected to come on stage in the role of Mr. Lee. He gets serenaded with the tunes, “Mr. 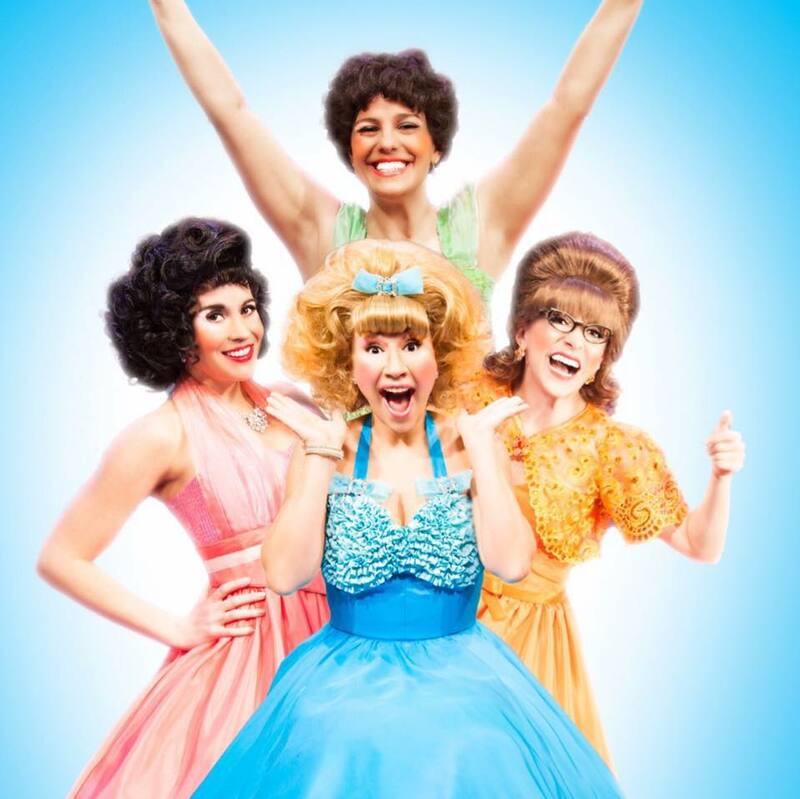 Lee,” “Born Too Late,” and “Teacher’s Pet.” With lightweight choreography from designer, Alex Ringler, there is plenty of cutesy hand jive and assorted moments of movement like the gals alternately bouncing up and down to the beat like the pistons of an engine. Predictable and corny at times? Well yes, and that might have moved one woman seated near me to whisper to her friend, “This is like the Lawrence Welk Show.” Nevertheless, I will borrow a line from Rodgers & Hammerstein and tell you that, “June is busting out all over,” down at the Kirk Theatre. Why not head over there yourself and see why “marvelous” is the operative word? MARVELOUS WONDERETTES continues at Theatre Row’s KIRK THEATRE, 410 West 42nd Street in Manhattan with performances Sundays at 3pm, Wednesdays at 2:30 & 8:15 pm, and Thursdays at 8:15pm. This entry was posted in BroadwayStars.com, Kirk Theatre, Marvelous Wonderettes, Off Broadway, Theater Reviews, Theatre Row, ThePeoplesCritic.com and tagged Kirk Theatre, Marvelous Wonderettes, Off Broadway, Theatre Row. Bookmark the permalink. It’s nearly time for me to crawl into bed….Now I shall be humming Mr. Sandman….or maybe Lollipop…which was my talent show song in 6th grade. Darn…just figgered out this was in New York!